Horse riding can be an enjoyable activity but it isn't the easiest skill to master. Read on for our advice on getting involved in horse riding. Anyone can take up horse riding, as it's not an activity that is affected by outside factors like age or background. As long as you're willing to learn, it doesn't matter if you've not got any previous experience. If you're new to horse riding, it's important to take lessons to fully get to grips with the basics. From there, you can take further lessons to learn more complex skills like show jumping. Contact your nearest riding school, group or club for more information on taking lessons. Riding lessons usually take place in the countryside, but they can also be done on public roads and bridleways. In the beginning, new students are often taken to privately owned outdoor fields, as there is a lot of open space to practice in. English-style riding is a good place to start. It's slightly more complicated than some other riding styles, but it's a great foundation for riding as a whole. Learning other riding styles will usually be a lot easier once you've got the hang of it. Your riding teacher will advise more on this. Perseverance is key when learning to ride a horse. Progress doesn't necessarily happen overnight, and it can be frustrating to feel like you're not moving forwards, despite the many lessons. It's tempting to give up if you feel you're getting nowhere, but this should be a last resort. As with most activities that involve taking lessons, it takes a while for everything to click into place (remember all those driving lessons when you felt like the biggest failure on the planet?). Always treat horses with the amount of respect that they deserve. Like most animals, they are acutely aware of how you treat them, and will be wary or even aggressive towards people who aren't courteous towards them. If you feel that your horse isn't showing you enough respect, you might want to bring it into line, as they can be dangerous and temperamental when it suits them. However, there's a fine line between discipline and abuse. Obviously, you'll need a horse, along with equipment like a saddle, tack and a hard hat. If you're taking riding lessons, the horse will usually be provided, but you may need to buy the other items yourself. It's best to check in advance to make sure that you're properly prepared before you turn up. 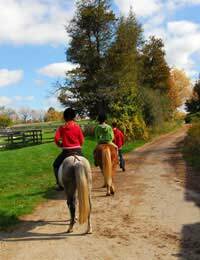 Horse riding is open to people of all ages, background and abilities. Riding lessons are the best way forward, as they can provide a good foundation for learning other types of horse riding. You don’t many specific skills when you first start learning, but strong patience and a willingness to learn will stand you in good stead, as horse riding isn’t the easiest skill to get to grips with. Don’t feel as though you’re a failure if you can’t get to grips with it straight away, as it often takes at least a few lessons to really get the hang of things.